I’m sorry to have to say this, especially as we think of roses as beautiful flowers, but I believe that some varieties are just more photogenic than others. 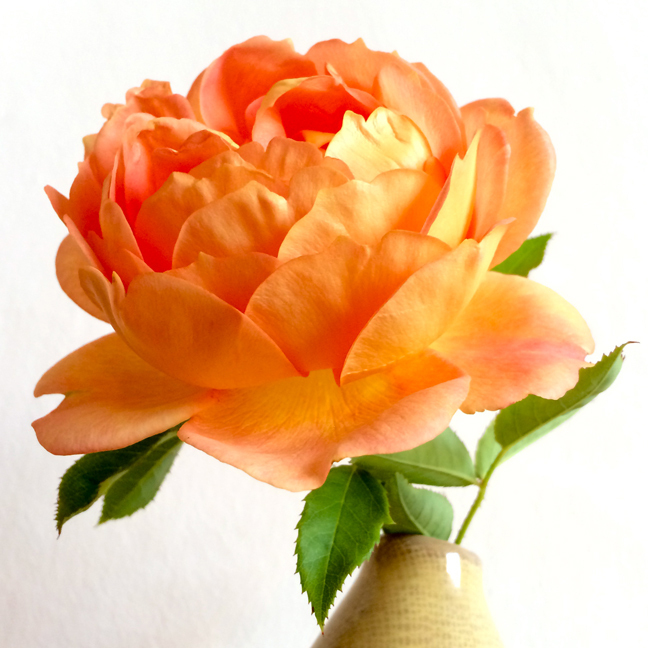 We know that it’s true of people: why would roses be any different? Four times out of five if I pick a nice, open bloom of certain English Roses – I’m thinking of ‘Crown Princess Margareta’, ‘Wildeve’, ‘Constance Spry’, ‘Grace’ or ‘A Shropshire Lad’ – I’ll be able to get a shot I like, quite quickly, from a variety of angles. The individual roses don’t even need to be perfectly formed: a few stray petals just seem to add to the grace of the flower. Four times out of five, my shots of individual blooms of certain roses tend not to turn out quite how I was hoping, no matter how hard I try. 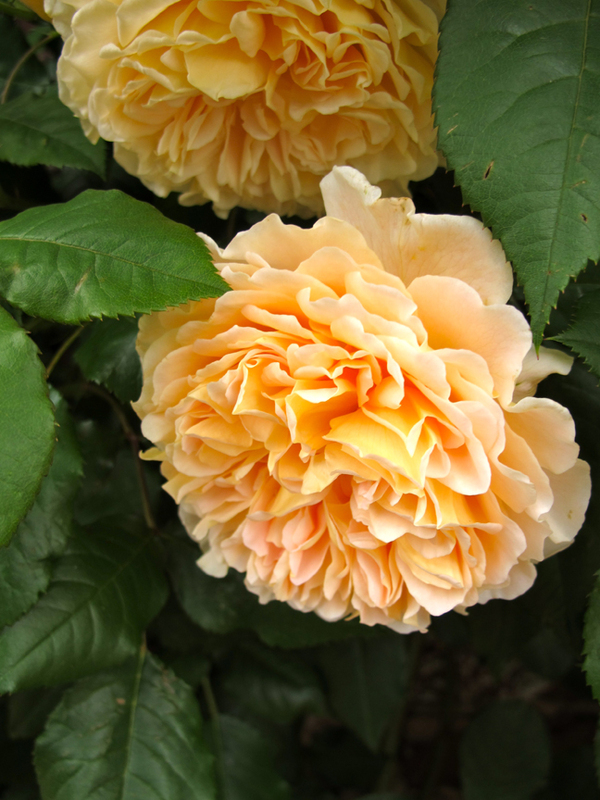 ‘Lady of Shalott’ is, in my opinion, not a particularly photogenic rose. That doesn’t mean it’s one I wouldn’t recommend – I grow it myself. It’s a wonderful shrub rose in the garden and I’ve seen some great pictures of the plant as a shrub covered in blooms, but it’s a different story when I try to take a single bloom close up. The camera unerringly picks up an impish or rebellious character in the petals that the eye doesn’t really see. It’s as if the flower is having the rose equivalent of a bad hair day. After quite a lot of persistence, I have managed to take some bloom shots I do like of ‘Lady of Shalott’, including the one below. The colour of this rose is very attractive to me. But it’s definitely more tricky to capture. If you’re a gardener, it’s well worth noting that the best garden plants are not always the most photogenic ones. That’s a little unfortunate as most plants are sold largely though photographs on websites or plant labels. One rose in particular always surprises me. I’ve seen many more beautiful – I would even say stunning – pictures of ‘William Morris’ than I’ve seen good-looking plants in the garden. The flowers have an indefinable quality that the camera loves. I’m sure some gardeners will have had success with this variety but I’d far rather photograph it than try to grow it! If you’re a photographer, it’s well worth pausing to take a picture of a ‘William Morris’ bloom if you spot one. It might just turn out to be one of your most alluring shots! I’ve seen a lot of pictures of roses, but there’s a few widely grown varieties that I’ve yet to see looking good in a photograph. Bloom shots of ‘Lady Hillingdon’, a classic old climbing rose, tend to look dishevelled or plain droopy. Perhaps after all, it’s just a matter of personal taste and I’d love to be proved wrong: if you know of a good bloom shot, of ‘Lady Hillingdon’, please send me a link! I never knew roses were either photogenic or not. I’ve just compared on Google images droopy Lady Hillingdon and William Morris and Bill is the supermodel hands down!